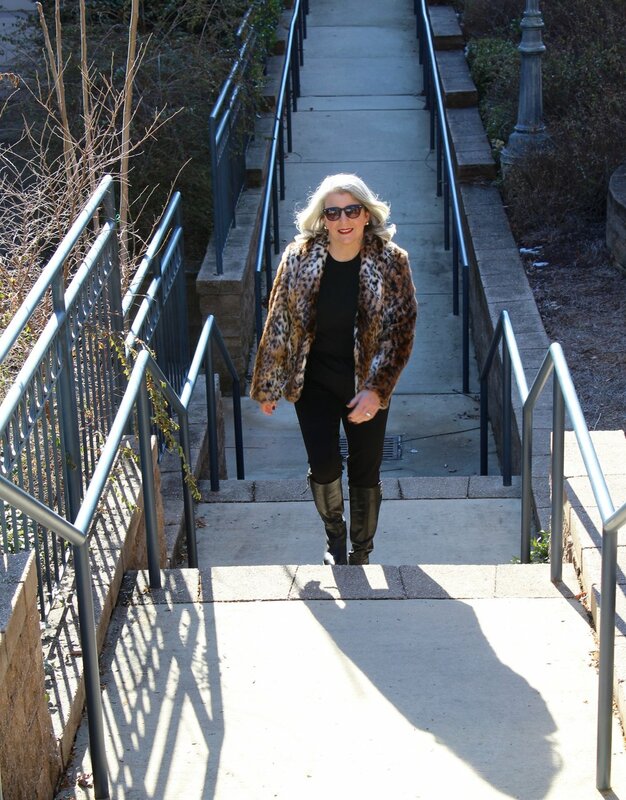 Back to fashion... sharing my love of this cute Chico's faux fur, animal print jacket in leopard. I love to throw on a cute jacket and go and this one really dresses up jeans or simple black pants with a touch of chic. I would also wear it with red, kelly green, white or brown. This jacket is very warm... so for the next couple of months, you can wear this literally everywhere. Do you have a favorite animal print jacket? And how do you wear it? This one is still available from Chico's and is a steal. But in case it sells out, I have linked a few others to provide choices! I had a fantastic week and hope you did too! Have to share my special news! My fourth grandchild was born and it is a healthy, baby girl. This is our first girl, in addition to 3 awesome little grandsons. She, weighed in at 9 lbs. 2 oz. and was born Feb 1. Momma and baby are doing great... very thankful!! It has turned cold again so back to my warmer clothes. I have been challenged finding high quality black boots due to skinny calfs. Ladies, if you have them, you know that they can be as troublesome as wide calfs can be. I had bought a new pair of Frye's and had to return them as they did not fit well. These Elliott Lucca's found at Lord and Taylor are very fitted and work perfectly. They are a bit taller but not over the knee. I worry that trend will go out as fast as I it did when I bought my last pair of over the knee boots! Best part...they are on sale. This brown fur vest is OOTC and is from Talbots, last year. I have posted similar vests... also on sale! Grab one now for next fall. The best part is this classic, animal print skirt from Harold's. Purchased over 10 years ago and I still get compliments on it, when worn! Who else loves to pair brown and black together? Hope everyone has a wonderful week and that you take time for yourself, since we are all pulled in so many directions.